On a short trip to New York City over the Thanksgiving holiday, I joined my cousin and his wife exploring parts of Manhattan which I hadn’t visited before. 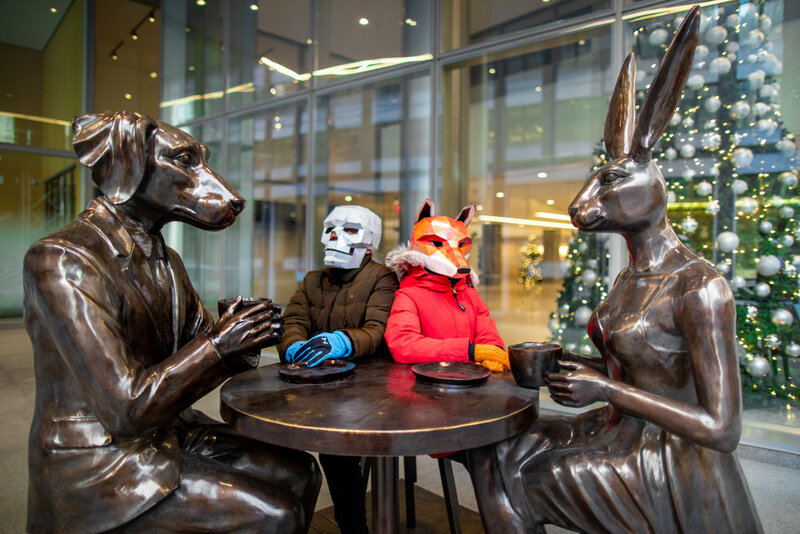 One of their ideas was to take a few portraits around the Helmsley Building next to Gillie and Marc’s Rabbitwoman and Dogman art installation titled Table of Love. My cousin and his wife decided to blend with the scene while donning their Wintercroft masks. Gillie and Marc are best known for their beloved hybrid characters – Rabbitwoman and Dogman – who tell the autobiographical tale of two opposites coming together to become best friends and soulmates. Rabbitwoman and Dogman promote diversity, love and acceptance. As unlikely animal kingdom companions, together the Rabbit and Dog symbolize unity and togetherness – representing all people as one. The artists met while working on a photoshoot in Hong Kong…and 7 days after meeting they were married on the foothills of Mount Everest. Because they came together while travelling, it’s always played a major role in their life and art. Rabbitwoman and Dogman are frequently featured travelling the world, with a dream that all creatures, regardless of race, religion, or orientation, can have a safe place to never be judged. They dream that open hearts, and open minds can come together in a world that’s torn apart by its differences – differences that are really the most beautiful thing of all! Posing in front of Gillie and Marc’s Rabbitwoman and Dogman art installation in New York City. In front of Gillie and Marc’s Rabbitwoman and Dogman art installation titled Table of Love in New York City. 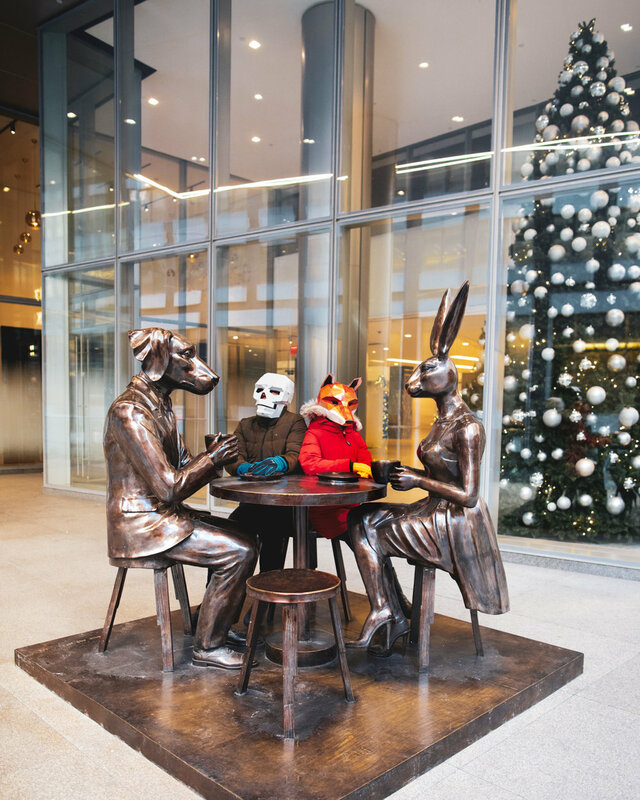 You can find the Rabbitwoman and Dogman as part of the Table of Love on the main level of the Helmsley Building in midtown Manhattan (on 46th Street between Lexington and Park Avenues; location on Google Maps: 237 Park Ave, New York, NY 10016, USA). Explore more of Gillie and Marc’s public art installations of the Dogman and Rabbitwoman here.